Thank you for taking the time to look at this site. I live in the U.K., Kent to be exact or as it was known in WW2 Bomb Alley. I started my interest in military items at a young age, Near to where I lived as a lad was a crashed German WW2 ME110 Aeroplane from which I collected my first military items which I still have too this day. My mother worked on a local farm and in the summer school breaks I joined her, two of the workers were former Home Guards, One was also in the Great War, I was all ears when I heard them say DURING THE WAR. Both my Grandfathers were in WW2 and my Great Grand fathers were in WW1, Although I did not meet one Grandfather and my Great Grand fathers. Stories were abound for a young lad from other relatives and friends about their exploits in war, so this is really where the interest lies in military History. 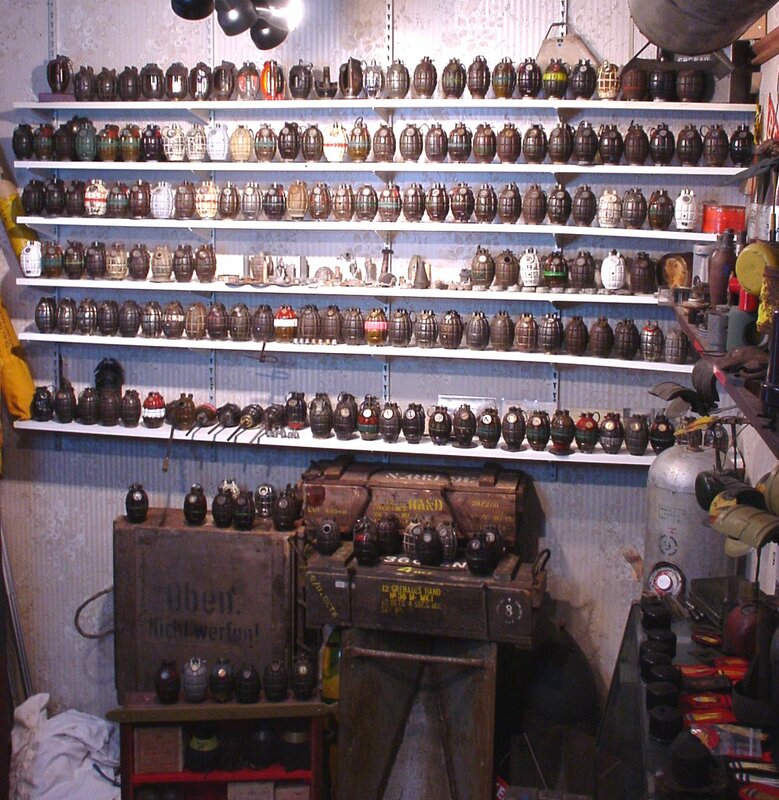 So why hand grenades, well I really started collecting German bombs after reading about the exploits of bomb disposal during WW2 and the Ingenuities of the Bombs and fuses produced by the Germans. I looked for these items at military fairs across the U.K. and later into Europe, as these items became Rarer and I was still visiting military fairs I was intrigued by the variety of hand Grenades available, especially the Mills Grenade, when I started collecting hand Grenades 15 years ago they were very cheap to purchase so I collected them as a side line but now its my main interest. Only since I discovered the internet has my collecting habit come out of the closet as too say, mainly on discovering the "The Grenade Recognition Manual" Web Site. Since surfing the net and using email, I have made contact with researchers and collectors from all over the world and all walks of life, As a result I have increased my collection and my knowledge of this subject and made some very good friends on the way. Most of the images are of my collection but I have also included images from other collections that I have been fortunate to visit and allowed to share the images with ever one who visits this site. Thank you for looking and please enjoy.